The Yakima is known throughout the country as a great dry fly and nymphing river with consistent fishing year-round. An overlooked aspect to the fishery is the incredible streamer fishing! Especially through the lower canyon swinging a big sculpin can get you fish all year, but for the upper sections of the river around our Cle Elum shop, fish can be pretty picky about eating certain bugs and a little guidance is needed. It’s best to break down the upper section of the Yak by seasons. The first being winter and early Spring, the second being late spring and early Summer, and the third being Summer and Fall. Each season requires a different tactic to get big fish to eat a streamer, where in the lower canyon you can get away with an olive sculpin pretty much year-round. Looking to learn more about how to fish sculpins? Click HERE! It’s important to realize that you’re going to want to make sure you have the right line or set up to fish streamers. Confidence is key, so make sure you feel positive that your flies are getting down to the fish. Sometimes, this means throwing a split shot above the fly, but most of the time it can be compensated with just a heavy sink tip. We really encourage that you stop by one of our shops and get yourself situated with a variety of polyleaders. These are sinking leaders that run a loop-to-loop system off the end of any line. Trout spey has become incredibly popular on the Yakima in recent years and is a great way to cover a lot of water, and they even help you turn over heavier sink tips that will help you get down to the fish. If you don’t want to invest in an entirely new set up, then just getting an extra spool for your real and spooling it up with an OPST commando head will work great. They cast amazingly on any single hand rod and OPST makes a variety of great sink tips that fish very well for single hand trout spey. This is the time of year where fish in the upper river are pretty lazy. They tend to group up in slow, deep buckets and seams and pick off little nymphs and stoneflies as they drift by. Just stick to smaller sculpins and leeches. They’re isn’t any salmon smolts or young trout around to where the fish feed up on them, and for the most part they really won’t be targeting a moving sculpin at all. 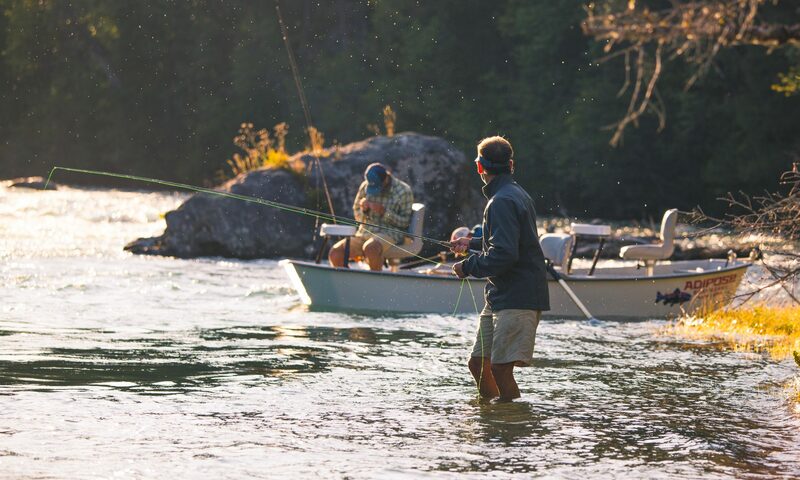 You can fish one of two ways this time of year. First, swing heavy, smaller sculpins and leeches. We like to keep it “low and slow” and keep away from fishing a floating line. We’ll typically fish a heavier sink tip line or add fast sinking polyleaders to the end of our floating lines. A 10-foot fast sinking polyeader swung with a big mend, or even dead drifted before the mend will help get you down to where you need to be. If swinging isn’t working, then it’s time to get a little dirty. Nymphing a streamer that might imitate a leech or injured sculpin is a great way to find some larger picky fish. A little split shot about a foot above your fly with a strike indicator might not really sound like streamer fishing (it’s nymphing let’s be honest) but can really save your day. This is a special time of year throughout the Pacific Northwest. Late spring, staring mid-April, you’ll start to see little pods of salmon fry making their trip back to the ocean and the trout will star to key in on them a bit. Swinging and stripping flies like sparkle minnows, or even some of your Puget Sound chum fry patterns can help you have an awesome day of streamer fishing. Just remember that sculpins will still work great this time of year, just tie them a little bit flashier. This is the time where you can start to get away with throwing some of your bigger sculpin patterns. Casting back to the bank from a boat, swinging big rocky runs, and throwing them under indicators are all great ways to find some bigger fish. Even letting them dead drift without an indicator through deep pools or behind rocks are great ways to find that hungry 20+ inch fish that’s been keeping you up at night. Throughout the fall, especially in September, we start to notice a lot of smaller crayfish crawling around in the rocks. Try stripping or nymphing smaller olive or brown crayfish patterns through slow deep water with lots of structure. Especially in September the fish will really go nuts for them. If you have any other questions that weren’t covered in this post feel free to give us a call or shoot us an email!